Well, not quite in his league. 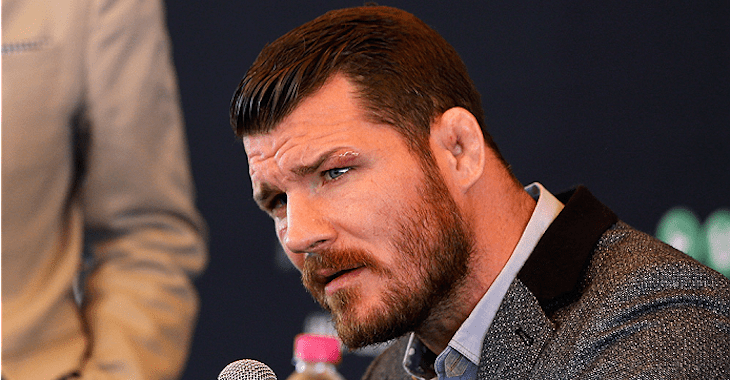 Bisping was, however, a fighter in his division before dropping down to 185 pounds and campaigning to get his hands on the middleweight title. While his record at middleweight left a lot to be desired, the general consensus was that he would never realize his ambition of winning a UFC title. Things do have a habit of getting a little surreal in the world of MMA sometimes. In 2014, Bisping would take on future champion Luke Rockhold in Sydney, Australia, and lose by way of second-round guillotine-choke. From there on, “The Count” put a string of three wins together, beating C.B Dolloway and Thales Leites before winning a much-contested unanimous decision over former dominant champion Anderson Silva, much to the surprise of many. At UFC 199, middleweight champion Luke Rockhold was set to defend the title he won over Chris Weidman over the former champion. Rockhold brutalized Weidman at UFC 194 in 2015 and many expected the second bout to be a little more competitive. When Weidman pulled out, Michael Bisping got the call. A hilarious but sometimes heated exchange between the two men prior to the fight in press conferences and online added a little interest for many who felt Rockhold would easily handle the Brit. “Speaking of guys that think they can take me – which of course when I say this, most people are gonna think he can take me – I was working with Daniel Cormier at the weekend and . . . all he kept talking about all weekend was, ‘Mike, I want to fight you next. I want to fight you.’ On air, off air, at the hotel, constantly. He was like, ‘Mike, I will break you within five minutes.’ Dude, are you crazy? Do you really believe that? “I don’t know if he’s joking or if he’s serious, but if he is serious, I’ll fight him next even though I said last week I’m gonna retire. I would fight Daniel Cormier because that would be a huge fight. DC is a great guy, he’s hilarious, hell of a fighter and he seems to be targeting a fight with me. So DC, if you’re serious, which I kind of think you are, then yeah, screw it, if only to annoy everyone in the world I will, again, fight somebody who doesn’t fight at middleweight. While Bisping is approaching the biggest fight of his career against returning legend Georges St-Pierre, it is unlikely that he is thinking past this for the moment. Rumors continue to grow suggesting that a deal for St-Pierre to fight Conor McGregor would be signed should he take the belt from Bisping, but once again, everything will rest on UFC 217’s main event. For Bisping, despite his detractors and haters, if he does beat St-Pierre he may have the last laugh with a bout against Cormier for the UFC light heavyweight title. If, by any chance, he came out on top in that bout, he would join an exclusive club of two-division champions.